Sightings of the rare oarfish in Japan have raised fear and speculation amongst the people of an incoming natural disaster, as the deep-water fish is believed to be a harbinger of earthquakes and tsunamis, the media reported on Saturday. On Friday, two oarfish were discovered after being caught in fishing nets off the Toyama prefecture, bringing the total found this season to seven, reports CNN. 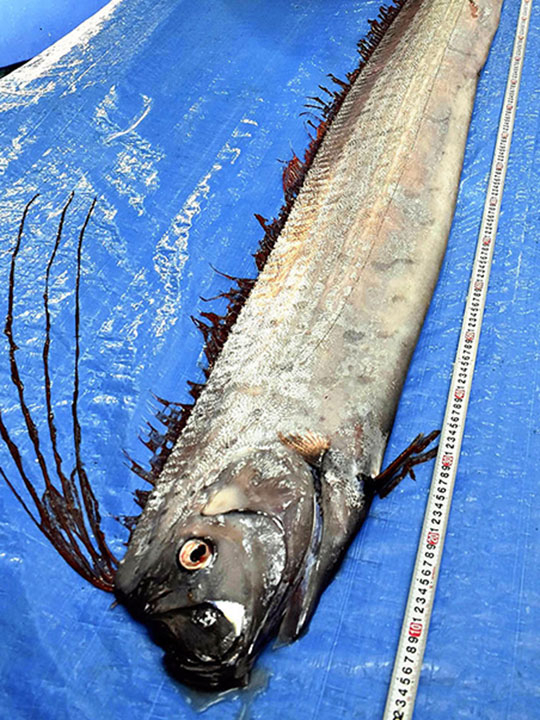 Earlier this week, a 3.2-metre oarfish washed up on the shore of Toyama Bay, while a 4-metre long oarfish was tangled in a fishing net off the port of Imizu. The elusive oarfish live between 200 and 1,000 metres deep and are characterised by silvery skin and red fins. Legend has it that they beach themselves on shores ahead of underwater earthquakes. But scientists dispute such claims. "There is no scientific evidence at all for the theory that oarfish appear around big quakes. But we cannot 100 per cent deny the possibility," Uozu Aquarium keeper Kazusa Saiba told CNN. The myth of oarfish as harbinger of destruction gained some traction after the 2011 Fukushima earthquake and subsequent tsunami, which killed more than 20,000 people. At least a dozen oarfish had washed up onto Japan's coastline in the year before the disaster, according to Kyodo News.